"At last, a target for my frustrations." Wrath-Scryer Soccothrates was an eredar wrathguard. He was once one of the Burning Legion's elite warriors, until he was captured by the naaru several millennia ago. He has since been stuck in a call on board the Arcatraz with Dalliah the Doomsayer, a fellow demon, who he hates. Adventurers later freed him from his cell, and fought and defeated him. If Dalliah was released before him, he would be quite happy to watch her demise, and congratulated adventurers on their victory. He didn't seem too upset about his own destruction, as deep down he always knew that death was the only way out of the Arcatraz for him. Last edited by Thalraxal on Thu Dec 10, 2015 7:53 pm, edited 1 time in total. "How fortuitous. Usually, I must leave me lair in order to feed." Onyxia was a black dragon, the daughter of Deathwing, and sister of Nefarian. With the disappearance of their father, command of the Black Dragonflight had fallen on the two siblings. To that end, Nefarian took control of Blackrock Spire, overtly ruling over its inhabitants and establishing it as a stronghold for the Black Dragonflight. Onyxia, meanwhile, established a lair for herself in Kalimdor, claiming a vast swath of Dustwallow Marsh and driving out the resident ogres in order to secure a safe place for his offspring to grow. While the victory of Nefarian's forces against the Dark Iron Dwarves seemed inevitable, Onyxia saw the greatest threat to the Black Dragonflight's holding was from the human nation of Stormwind. In order to ensure the success of the Black Dragonflight, and likely to secure more power for herself, Onyxia took the guise of Lady Katrana Prestor and infiltrated the royal court of Stormwind. As Katrana Prestor, she quickly rose to power, gaining considerable influence within the Court of Nobles. At this time, the Stonemason's Guild had just completed the reconstruction of Stormwind, repairing the damage the city had sustained during the First War. Working from behind the scenes, Lady Prestor was convince many of the nobles that they didn't actually need to pay the stonemasons for their work. The leader of the Stonemason's Guild, Edwin VanCleef was outraged by this decision, and demanded that he and his people be properly compensated for their work. King Varian was able to convince both parties to sit down and talk, but was unable to reach any sort of agreement that made both the Court of Nobles and the Stonemason's Guild happy. Varian was able to get the stonemasons paid for their work, but it was considerably less than they had been promised. Edwin VanCleef, along with much of the Stonemason's Guild, outraged by this perceived treachery, stormed out of Stormwind. Forming the Defias Brotherhood, Edwin established a secret base within the Deadmines, and plotted his revenge. Onyxia recognized King Varian as being the greatest impediment to her taking control of Stormwind. When he left to travel to Theramoore to discuss Alliance-Horde relations with Jaina, Onyxia arranged for him to be captured by agents of the Defias Brotherhood. While the Defias agents were successful in kidnapping Varian, they ended up shipwrecked in Dustwallow Marsh. Varian ended up on Alcaz Island as a prisoner of the naga until he mysteriously disappeared one day. With King Varian missing, Bolvar Fordragon was named Regent of Stormwind, with Lady Prestor serving as his advisor. She was quick to take control of Bolvar, charming him with magic and making him much more willing to heed her advice. Despite there being no evidence for King Varian's death, Prestor was able to convince Bolvar to have Varian's son, Prince Anduin, crowned as King of Stormwind. With Stormwind effectively under her control, Onyxia did much to sabotage the kingdom. She withdrew support of the Stormwind Guard from many of Stormwind's provinces, leaving the towns of Moonbrook, Lakeshire, and Darkshire to fend for themselves, and allowing the problems facing them to grow out of control. Soon, Moonbrook fell under the control of the Defias Brotherhood, along with much of Westfall. Many of Moonbrook's former residents took shelter at an old watchtower, known as Sentinel Hill. Duskwood was soon overrun by worgen and the undead, with the village of Raven's Hill all but abandoned. Lakeshire was left to fend for itself against the Blackrock orcs, who watched helplessly as the orcs took control of Stonewatch Keep, a bastion meant to protect Lakeshire from attack from the Burning Steppes, and transform it into their base of operations in the region. Marshal Reginald Windsor, a knight of Stormwind commanding a small force in the Burning Steppes, was able to learn that the Black Dragonflight had an agent controlling the Kingdom of Stormwind from within. Realizing that it could only be Lady Prestor, he planned to confront her and reveal the truth. Fortunately for Lady Prestor, he was captured by the Dark Iron dwarves before he could do so. "Curious... Windsor, in this vision, did you survive? I only ask because one thing that I can and will assure is your death. Here and now." Unfortunately for Lady Prestor, he was eventually rescued by adventurers, who were able to recover Windsor's confiscated notes. Together, the adventurers and Windsor returned to Stormwind. Lady Prestor ordered Windsor's arrest, however the Marshal was able to convince the guard not to do so. He arrived in the throne room and confronted Prestor, forcing her to assume her true form. Revealed to be a black dragon, Onyxia killed Windsor and fled, retreating to her lair in Dustwallow Marsh. Bolvar, freed from Onyxia's control, ordered the adventurers to slay the dragon. After reforging the Drakefire Amulet, the key necessary to access her lair, a group of adventurers raided it and killed her, taking her head as proof of the deed. Her head was then mounted on the gates of Stormwind. When King Varian returned in Wrath of the Lich King, Lady Prestor was removed from Stormwind's throne room, along with Bolvar. 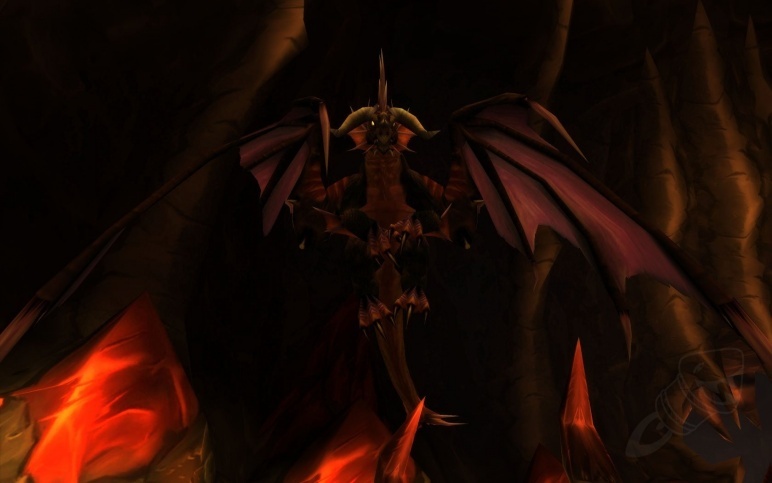 As part of the WoW's Fifth Anniversary Celebration, Onyxia had her level increased from 60 to 80. Curiously, WoW's Fifth Anniversary was November 23rd, 2009, just two days from now. Onyxia's presence so close to that date seems to suggest that Blizzard had planned to revamp her lair well in advance. Upon his return to Azeroth, and unleashing the Cataclysm, Deathwing raised his son, Nefarian, from the dead. While it was in his power to restore Onyxia as well, he saw no need to. While he could make use of Nefarian's scientific knowledge and various mad experiments, Onyxia's manipulations had already been played out. Nefarian, however, saw the unfairness of this and took matters into his own claws. Using his scientific prowess, and new found interest in undeath, he recovered his sister's head and body, connected them, and transformed her into a mindless electric powered zombie dragon. He then unleashed her upon adventurers who attempted to raid his new lair, deep beneath Blackrock Spire. She was destroyed once again, and Nefarian soon after. Today is the Anniversary of WoW's release! We have a very dour looking draenei and a jovial blood elf celebrating, with blood elf suggesting that the draenei should lighten up, because it's their anniversary. In 2009, this was WoW's Fifth Anniversary. 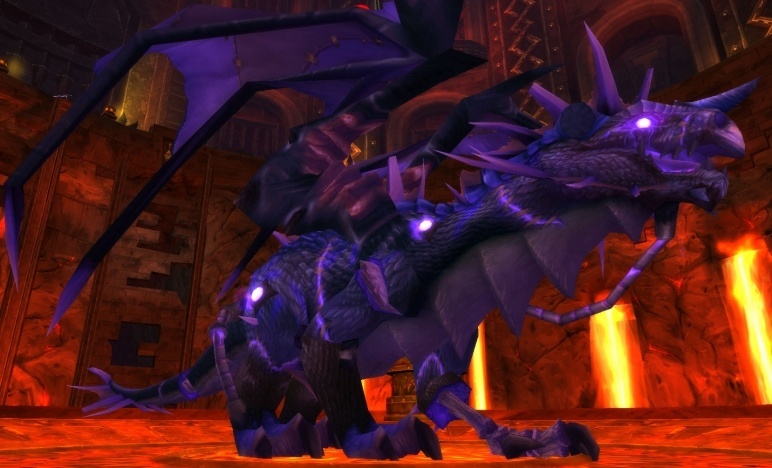 To celebrate, they revamped Onyxia's Lair, increasing it from level 60 to level 80 (the then-current level cap). They also gave everyone who logged in at that time a free Onyxian Whelpling. This year, 2015, is WoW's Eleventh Anniversary. As Blizzard's official policy is to only have a major celebration on anniversaries of significant milestones, players this year will only get a celebration package in the in-game mail. It includes wands to disguise other players as gnolls or murlocs, and a costume that lets you disguise yourself as Edwin VanCleef, and an inflatable Thunderfury, Blessed Blade of the Windseeker. All are limited-use items. Last year, WoW's tenth anniversary, had a revamped forty-man Molten Core, a Southshore vs Tarren Mill battleground, and free molten corgis for all! Interestingly enough, November 23 is also the anniversary of the release of WarCraft I: Orcs and Humans, making it the twenty first anniversary of the WarCraft franchise. It would have been the fifteenth in 2009, and the tenth in 2004, when World of WarCraft was first released. Interestingly enough, they only celebrated their World of WarCraft anniversary during BlizzCon last year, with a pin included highlighting "ten years". The pins are far too expensive, and Blizzard is really pressured financially. After all, keeping Kotick's various warehouses heated with nothing but $10,000 bills is tony's greatest work. "I'll feed your souls to Hakkar himself!" Bloodlord Mandokir was a Gurubashi troll, member of the Hakari, a loyal servant of Hakkar the Soulflayer, and a lord among trolls. He was also the keeper of the Razzashi Raptors, swift riding raptors of the Gurubashi trolls. His best friend and constant companion was his raptor, Ohgan. Most terrifying of all, Bloodlord Mandokir had learned how to level up by killing adventurers. He likely played a key role in Jin'do the Hexxer's rise to power amongst the Gurubashi, and the rise in prominence of the Hakkari. Despite this, he was killed by adventurers when they stormed Zul'Gurub to stop Hakkar the Soulflayer. On their way in, they killed him, and his pet raptor too. Somehow, through an unknown series of events, Mandokir was decapitated following his death, his body desecrated and destroyed by the Bloodscalp trolls, and his skull was discarded in a large pile in the Bal'lal ruins. His skull remained there for several years, until sometime after the Cataclysm, an adventurer, who had befriended the daughter of Ohgan, retrieved his skull from the pile at the young raptor's behest. Curious to find out what made this mysterious troll skull so special, they took it to the nearest specialist in troll magic. Maybe a gnome, or a troll witch doctor. Either way, the adventurers accidentally resurrected Bloodlord Mandokir using the body of Gan'zulah, the former chieftain of the Bloodscalp. The newly resurrected Mandokir promptly kidnapped the adventurer's baby raptor and returned the Zul'Gurub. "Your broken body belongs to Hakkar!" Upon his return to Zul'Gurub, he encountered the disembodied spirit of Jin'do the Hexer. Together, they worked to summon Hakkar once more, and restore Zul'Gurub to greatness. With the help of Ohgan's daughter, he was able to find the remains of Ohgan, and raise her from the dead as a skeletal raptor. Jin'do and Mandokir soon found themselves with an offer from an unexpected source. The Zandalari trolls, the ones who had once ordered their deaths, had come on hard times themselves. Now seeking to restore the troll empires of old, they offered Jin'do their aid. They gleefully accepted the Zandalari's offer, and using his new power, Jin'do was able to summon and bind Hakkar, claiming the Soulflayer's power for himself. With this new power, the Gurubashi tribe moved to reclaim their ancient empire, launching attacks on the numerous camps of interlopers in Stranglethorn Vale. Mandokir personally led the attacks on the Alliance's camp to the north, and the Horde's outpost, Grom'gol Base Camp. Under the direction of the Darkspear trolls, adventurers were directed to attack Zul'Gurub once more. They stormed the ancient troll city, and killed Mandokir again, successfully rescued their baby raptor from his clutches. Jargba pays a deadly visit to anyone who would oppose Charlga Razorflank's decisions. Death Speaker Jargba was a quillboar warrior and captain of the Death's Hand. As a Death Speaker, Jargba's job was to spread the word of the Death's Head cult to the quillboar of Razorfen Kraul, enforce the will of Charlga and the Scourge, and deal with any dissidents. Jargba was particularly skilled at his job, as he'd somehow mastered the power to control the minds of people, and help them see the error in their ways. Despite his mastery of mind control, Jargba was killed by adventurers. Death, however, would not be the end of him, and not just because that's usually one of the perks for being a Scourge cultist. His former commander, Warlord Ramtusk, having had a few close calls in recent encounters with marauding adventurers, had taken something of a more spiritual bent in his old age. As such, he learned how to call upon the spirits of his deceased comrades, Jargba and Aggem Thorncurse. Despite his best efforts, however, Jargba could not prevent the death Warlord Ramtusk. The mighty quillboar warlord fell to the relentless attacks of the adventurers, and Jargba's spirit was banished back to the spirit world once more. El Pollo Grande, the Black Chicken of Death, was a mighty infernal chicken summoned by the gnome warlock, Niby the Almighty. Warlock adventurers, seeking to learn the secrets of how to summon Infernals, sought out Niby and his imp minion, Impsy. Niby and Impsy agreed to help teach the warlock, assuming they helped them first. In order to summon his own Infernal Destroyer, destroy Stormwind, and have his vengeance, Niby needed the still burning infernal core of the infernal, Kroshius. This was a challenge because Kroshius had already been defeated, and his flames extinguised. In order to complete the task, warlocks first had to reignite the fallen infernal. After doing so, and destroying Kroshius and claiming his infernal core, the warlock delivered it to Niby. With Kroshius' infernal core in hand, Niby finally had the power necessary to summon his tool of vengeance. What he got, however, was not an Infernal Destroyer, but a giant chicken. Niby later joined the Ashen Verdict, a joint operation between the Argent Crusade and Knights of the Ebon Blade, and helped forge armour for warlock in the battle against the Scourge in Northrend. His dreams of vengeance against Stormwind have still gone unrealized. Impsy remained in Felwood for a time, where he was later coerced into helping adventurers against the Jadefire Satyr. He later travelled the Draenor, where he investigated the disturbances in the Twisting Nether. Determining that Ner'zuhl's dabbling in Void magic was the cause, he sent adventurers to retrieve a Void Gate Key for him, and maybe kill the elder shaman of the Shadowmoon Clan while they were at it. Void Gate Key in hand, Impsy proceeded to save the worlds, off-screen and without thanks. Kroshius was reignited once more following the Cataclysm, however he was destroyed by adventurers once again. El Pollo Grande was delicious. Among the most favoured of the flamewalkers, Sulfuron is the terrifying herald of Ragnaros himself. Sulfuron Harbinger was the leader of the Flamewalkers, commanding the likes of Ambassador Flamelash and Shazzrah. Only Majordomo Executus outranked him amongst the Flamewalkers. He also served as the Herald of Ragnaros. He seemed to be the only member of Ragnaros' court who was knew of Shazzrah's schemes. Although he was aware the Shazzrah's desire to claim the two halves of the Talisman of Binding from Baron Geddon and Garr, he saw no need to inform either of them of this, despite their increasing paranoid fears of each other. Despite his might, Sulfuron was killed by adventurers when they raided the Molten Core. 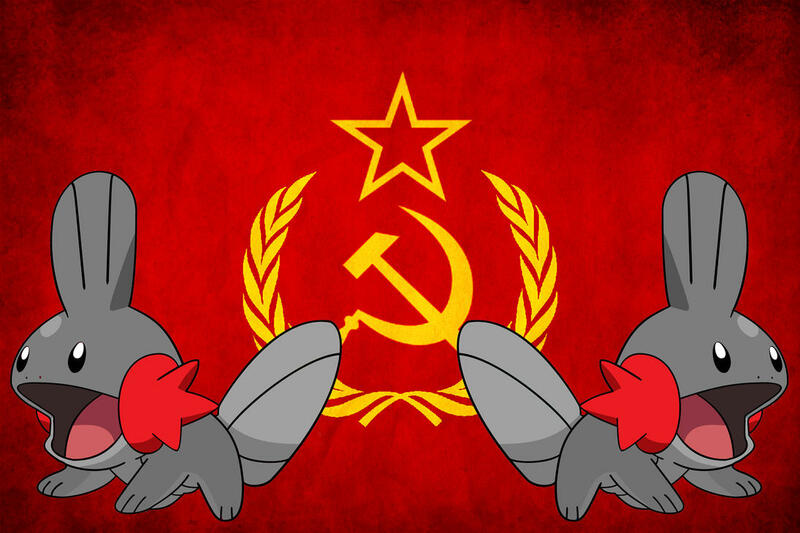 "You outsiders will pay for encroaching on our land!" Charlga Razorflank was the leader of the Razorfen tribe. As a powerful and gifted shaman, Charlga quickly rose through the ranks of the Razorfen tribe, and soon found herself as its leader. As the leader of the tribe, Charlga dedicated herself to finding a way to resurrect the ancient demi-god who had created the quilboar, Agmaaggan. Agamaggan had been killed fighting in the War of the Ancients, leaving his quillboar children without his guidance. Despite her seemingly noble intentions of restoring Agamaggan, Charlga's actions have been anything but. As leader of the Razorfen, she worked to drive out her rival tribes from Razorfen Kraul, made war with the tauren in the southern Barrens until they fled, and allied with the Scourge following their slaughter of the quillboar in Razorfen Downs. After allying with Amnennar the Coldbringer, she joined the Death's Head cult, and was quickly instated as its leader. Even her efforts to resurrect Agamaggan have turned increasingly to darker and darker magics, eventually earning her the ire of the spirit of her own god. With her alliance with the Scourge secure, Charlga had planned to make war against her other new neighbours, the Horde. As such, she began to rally her tribe's warriors, as well as the Death's Head cult. Hearing news of the quillboar's plans, agents of the Horde and Alliance intervened to put a stop to them. While they were successful in sabotaging the Charlga's plans for conquest, for the being anyway, Charlga herself survived their attack on Razorfen Kraul. "I see you, interlopers. You tread on sacred ground..."
Following the Cataclysm, the southern Barrens was plunged into war anyway, although it was not the one the quillboar had envisioned. The Horde and Alliance battled against each other for dominance of the region, seemingly forgetting about Charlga Razorflank and her quillboar tribes. This gave the Razorfen the reprieve they needed. While the war had ended, an unsteady peace formed between the Horde and Alliance, and their heroes away fighting some otherworldly Iron Horde, Charlga was ready to strike. Unfortunately, there were still other adventurers will to put an end to her, this time at the behest of her own god. Agamaggan, having watched in horror at the atrocities Charlga and the Razorfen had committed in his name, grew tired of them, and tasked the adventurers with killing Charlga and her minions. They did so, putting an end to Charlga, and ending the Razorfen's plans for conquest. The only thing more vicious than a core hound is the beast that sired them. Magmadar was the first core hound, and favoured pet of Ragnaros. Ragnaros would feed Magmadar table scraps, the remains of his enemies and of those who displeased him, earning him the mighty core hound's eternal loyalty. He has since gone on to sire generations of new core hounds. Ragnaros had brought Magmadar along with him as he reestablished his court within the Molten Core. Magmadar was killed by cruel, vicious adventurers when they raided the Molten Core. Nerub'enkan, like most of the Scourge's nerubian minions, had been a veteran warrior of the Spider War, before she was killed and transformed into a crypt fiend. She was eventually tasked with serving Baron Rivendare in Stratholme, who tasked her with guarding one of the three Scourge ziggurats that maintained the barrier protecting the Slaughter House where he resided. Nerub'enkan did this, until she was destroyed by agents of the Argent Dawn. She was, however, restored once more to unlife. Following Baron Rivendare joining the ranks of the Four Horsemen, and leaving for Naxxramas, she continued to serve his son and successor, Aurius Rivendare. She then was destroyed once again, by agents of the Argent Crusade. "None may steal the secrets of the Makers!" Ironaya was a Titan construct who had been tasked with the construction and maintenance of the Uldaman complex. As the entire complex has been sealed and buried deep underground, it would seem as though she has neglected her duties for some time. Following a great civil war between the storm giants and the earth giants, Prime Designate Loken determined that the safest course of action was to place the bulk of the Titan's creations into stasis. Uldaman was designated for use as one of the storage areas, and was likely used to house earthen. Ironaya likely entered stasis alongside them. Without her maintaining the facility, however, the complex fell to ruin, and was eventually buried under rock and earth. A model of the Uldaman complex, as it appeared when not buried under countless tonnes of rock. Some of the earthen managed to avoid containment, either by escaping Uldaman, or else they ignored Loken's orders. These earthen eventually transformed into dwarves, as a result of the Old Gods' Curse of Flesh. Thousands of years later, they eventually returned to Uldaman, unearthing the lost Titan complex in an effort to glean its mysteries. Instead, they accidentally unleashed a horde of troggs who had been trapped within the complex. It would seem as though some of the earthen who had been placed in storage there had succumb to the Curse of Flesh, but had been transformed into troggs instead of dwarves. With the dwarves' digsite overrun by troggs, and rumours of treasure, and secrets still hidden deeper in the titan ruin, adventurers were quick to travel to Uldaman and explore it for themselves. There, they managed to release Ironaya from stasis. 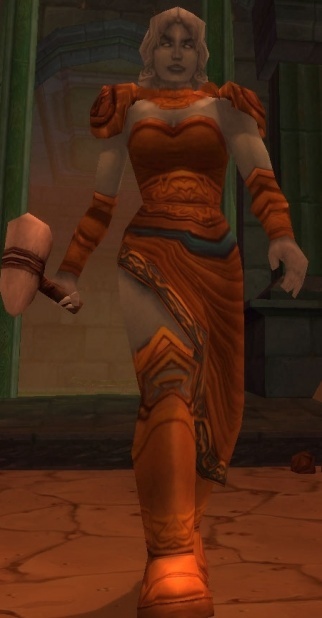 Ironaya, however, perceived the adventurers as intruders and looters (which, really, they were), attacked them in an effort to defend Uldaman and its secrets, and was killed as a result. Halycon was a massive worg, and den mother to the worgs of the Blackrock clan. She was known to be so savage and fierce, that it was rumoured that she was actually a demonic wolf who had been given to Rend Blackhand as a pup by a pit lord. Both the Alliance and Horde saw the Dark Horde's seemingly endless number of worgs as a threat, and both tasked adventurers with her destruction. She was killed by adventurers, after which her mate, Gizrul the Slavener, attempted to avenge her death. Halycon should not be confused with hacylon, or tales thereof.